The Fitted Diaries: Red Dead Redemption? Good afternoon fitted fans! Today, The Cincinnati Reds are on my mind. While going through my fantasy baseball teams rosters, I kept seeing Reds players that seem to have a high ceiling so to speak. We all know Joey Votto won the NL MVP last season, and Aroldis Chapman can throw 200MPH, but there are also some players on this roster who are currently a bit under the national radar of players with a bright future. Starting off in the bullpen, we have Jose Arrendondo. For those of you who do not know, he has been a fixture in Anaheim for the Angels. With a career 3.48 ERA, and nearly as many strikeouts to innings pitched this guy will definitely hold his own in the NL. Also on this roster destined for the post season, is pitcher Homer Bailey. Homer Bailey has been a prospect in the Reds system since about 2005. Hes a big body, with a strong arm who is just coming into his own. With Cueto, Volquez, and Arroyo in the rotation with him, this pitching staff has 90 win season written all over it. The last guy I want to talk about is Drew Stubbs. Last season was his first full one in the majors, and he didn't hit as well as some thought he would. He definitely made his mark with the power numbers he put up. 22 home runs and 77 RBI's aren't too bad considering he only hit .255. This team found it's way back into the playoffs for the first time in a while last season, but ran into a difficult Philadelphia team in the first round. With the ammunition this roster has in the bullpen and on the field, don't be surprised if they make a run at the NL Central title. The cap featured in the picture above is one of the official on field caps that the Reds will wear this season. 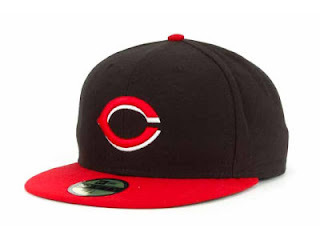 It features a red brim, black crown, and the signature Cincinnati "C" centered in the front. It can be found at Lids.com here: http://www.lids.com/MLB/Cincinnati-Reds/20076640 Look out St. Louis, it wont be that easy this time around. I like the classic red caps better. Nice to have you back.